Explore more options to choose from to supplement your online purchase of TwinLuxe products. For spa, salon, and/or barbershop establishments, please check out our Professional Size Spa Back Bar products. For special requests of any kind, please email us at inquire@twinluxe.com. We will try our best to cater to your needs. Be the first to know about TwinLuxe products. Subscribe here to receive notification of all TwinLuxe private special promotions and events, newly launched skin care products, and limited edition 'Fine Shaving Instruments' luxury shave sets. TwinLuxe offers its entire paraben-free 'Shaving Skincare' line in wholesale Professional Sizes. If you are a spa, salon, barbershop or skin care clinic, consider TwinLuxe Pro Size backbar products for your women's and men's skincare bulk needs / spa supplies. We can work with you to develop a unique male or female signature facial spa treatment protocol or luxury facial shave treatment using our high performance 'Shaving Skincare' range for exclusive use in your establishment. If you have any questions about the TwinLuxe 'Shaving Skincare' Pro Size spa back bar products, please email us at inquire@twinluxe.com. The TwinLuxe Gift Card is an ideal, sophisticated gift for your husband, friend, family, or business associate. Purchase a TwinLuxe Gift Card for any special occasion such as Father's Day, Christmas, birthday, anniversary, job promotion, or simply to say "Thank You." You will be able to type in a personalized gift message during checkout. TRADITIONAL GIFT CARD – delivered by mail courier to Recipient’s physical address. VIRTUAL GIFT CARD – delivered online to Recipient’s email within 1 business day (coming soon). *For detailed terms please see 'Gift Card Use'. Personalize your TwinLuxe 'Fine Shaving Instruments' shave set. Perfect unique and sophisticated gift for that special someone. The chromed base plate on the TwinLuxe 'Fine Shaving Instruments' set is customizable. 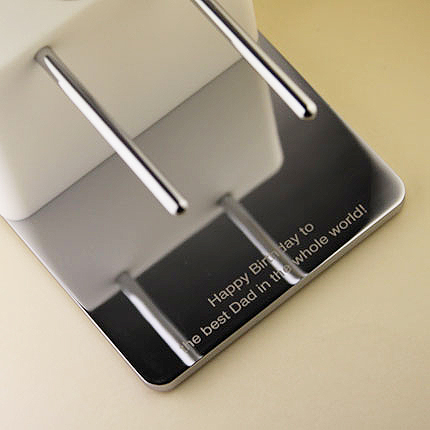 Engrave your initials, your name, or a personal message. Simply add your personal message after selecting your TwinLuxe 'Fine Shaving Instruments' shave set to the shopping cart. Customization will take up to two weeks to process and manufacture. Please note that any "customized" TwinLuxe 'Fine Shaving Instruments' shave sets are not returnable or exchangeable, and not eligible for any refunds. We can ship your TwinLuxe 'Fine Shaving Instruments' set with a beautiful satin ribbon along with a personalized greeting card. At checkout, simply check “Gift Wrap” and type in your personal message in the message box. * Gift wrapping is currently not available for 'Shaving Skincare' products. For corporate gift orders or special customization requests, please contact us directly at inquire@twinluxe.com.